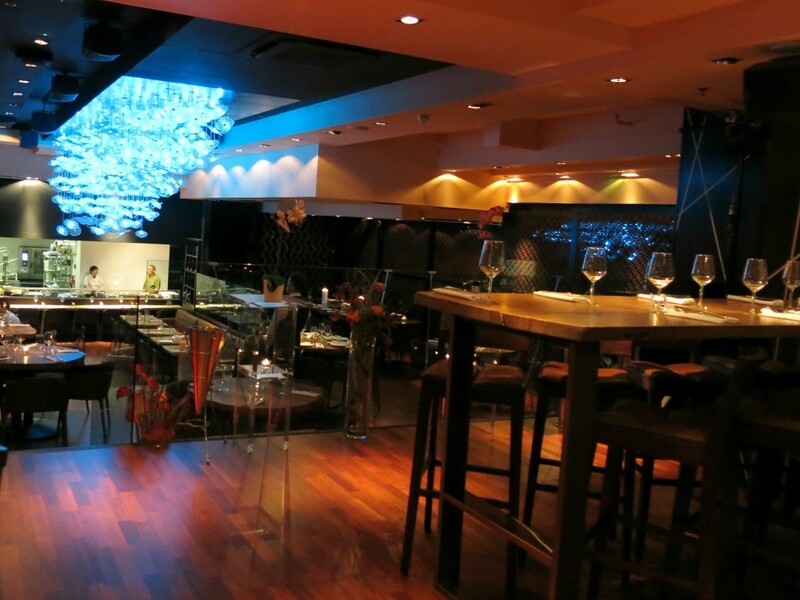 There is definitely a growing trend of fusion Japanese/European restaurants in London. I love both cuisines and so I’m always happy to try out new menus! DSTRKT London, located just moments from Piccadilly Circus offers just that, a mixture of small plates, grill, sushi and sashimi. We almost walked past the doorway down to the restaurant, but a after quick double take we made our way in and down into the depths of the building where the restaurant is housed. 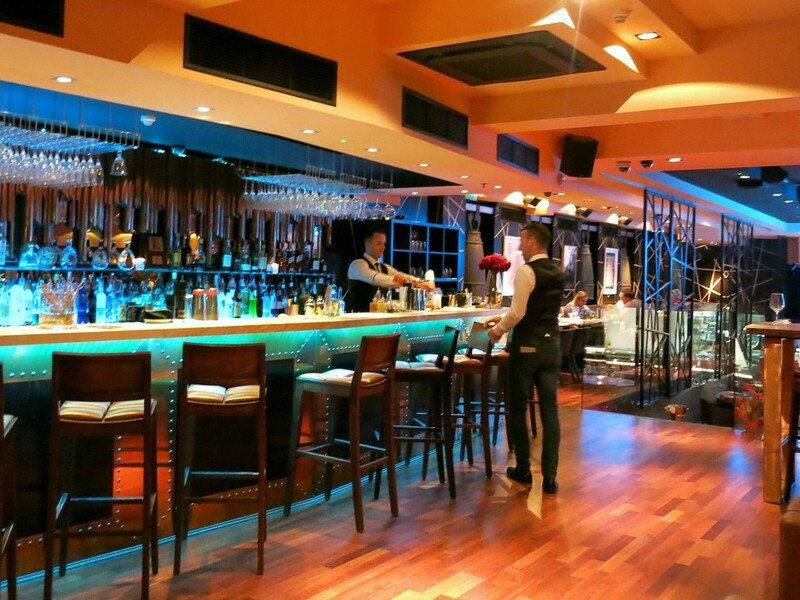 Although underground, the split level restaurant at DSTRKT London feels spacious and welcoming. There is a massive light installation which I think look like jelly fish – non? We were a little early for our reservation so we happily sat at the bar to enjoy a cocktail. We sipped on extremely well made Whisky Sours and Amaretto Sours (our favourites) whilst sat there picking out our favourite looking spirit bottles behind the bar – some of them are so beautiful. I eye up which ones I’d like to use as a vase for flowers at home. Does anyone else do this!? The menu at DSTRKT offers a range of Japanese, and modern European cuisine, in addition to various charcoal grilled dishes. It is open for pre-theatre and continues throughout the evening with it’s own DJ. We arrived at 7pm on a Friday and it was pretty empty but the restaurant started to fill towards the end of our meal. I’d been invited to try the new menu and so we were brought a selection of their favourite dishes. 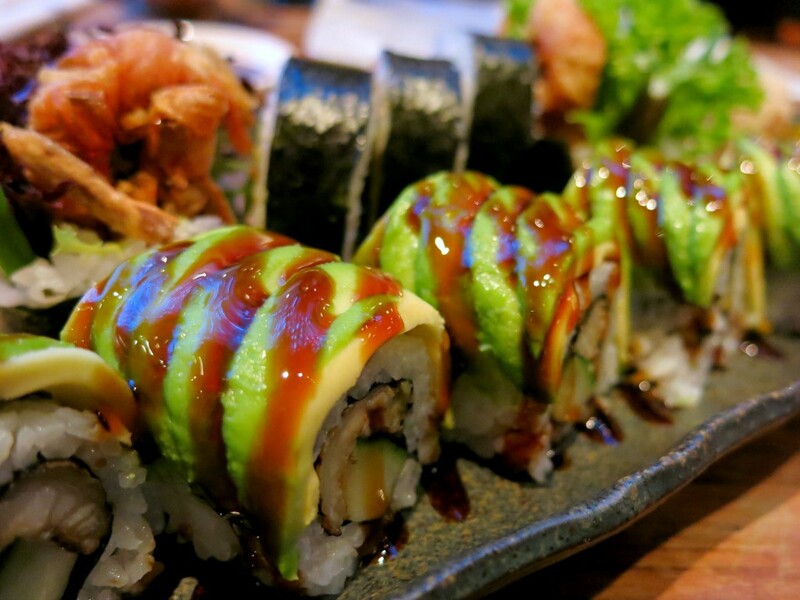 First to arrive was a plate full of soft shell crab maki rolls and dragon rolls. The soft shell crab was light and delicious. I had not tried dragon rolls before, where the avocado is on the outside of the sushi roll, resembling the scales of the dragon. It’s basically an inside-out sushi roll! I enjoyed these little bites filled with eel and cucumber, though they are pretty messy to eat with the avocado sliding all over the place. Maybe not a first date dish!? 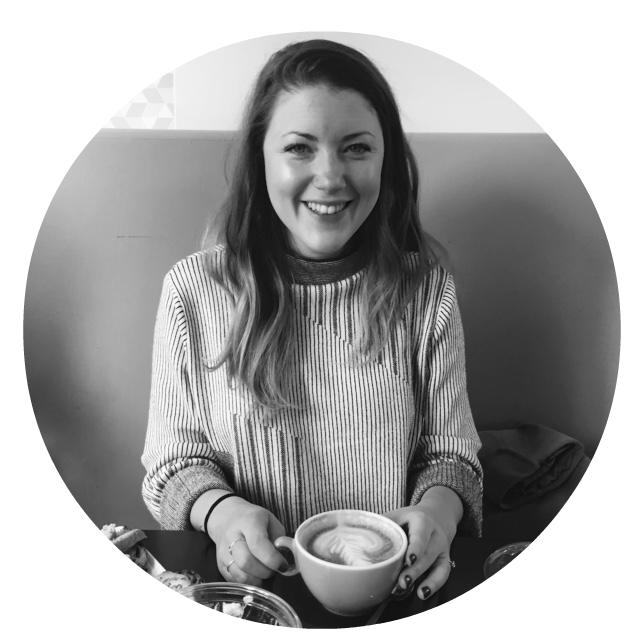 FYI – I was dining with my husband and not on a first date, so all way okay. Next came vegetarian spring rolls and edamame beans. 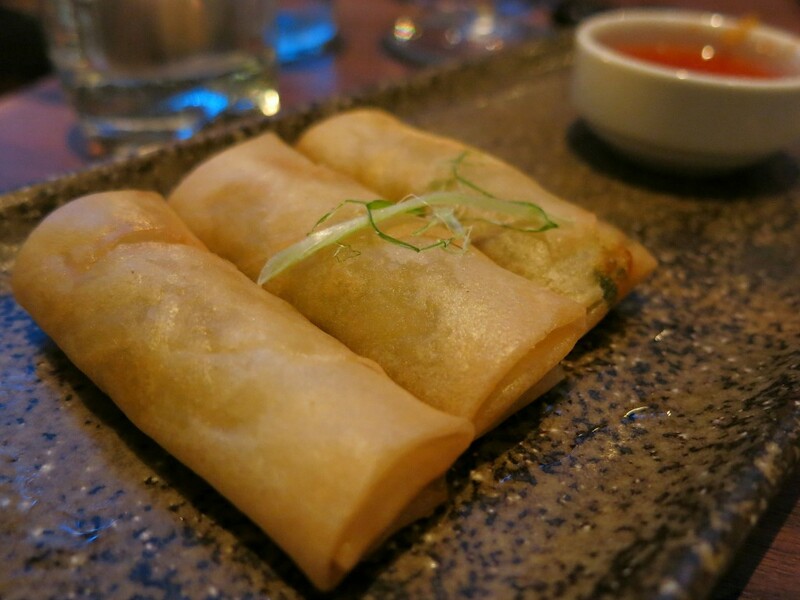 The pastry on the spring rolls was nice and crisp, but the filling a bit meh. I always love an edamame bean and these were as tasty as they can be, though I’m not sure this part of the meal was showcasing their best dishes. A bowl of crispy squid was brought to the table and I soon forgot. 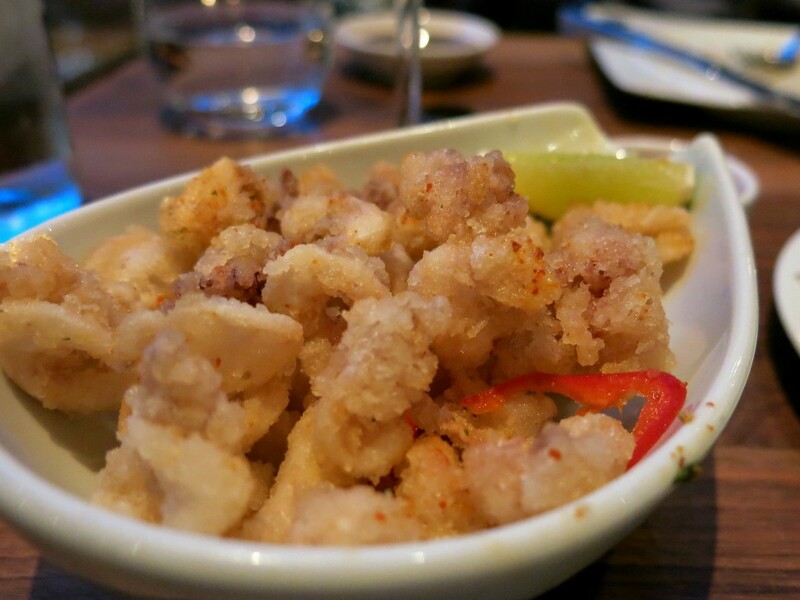 I enjoyed the chilli/salt combo on the batter – I will nearly always order a portion of salt and pepper squid if I see it on a menu. These were a great version on one of my favourites. 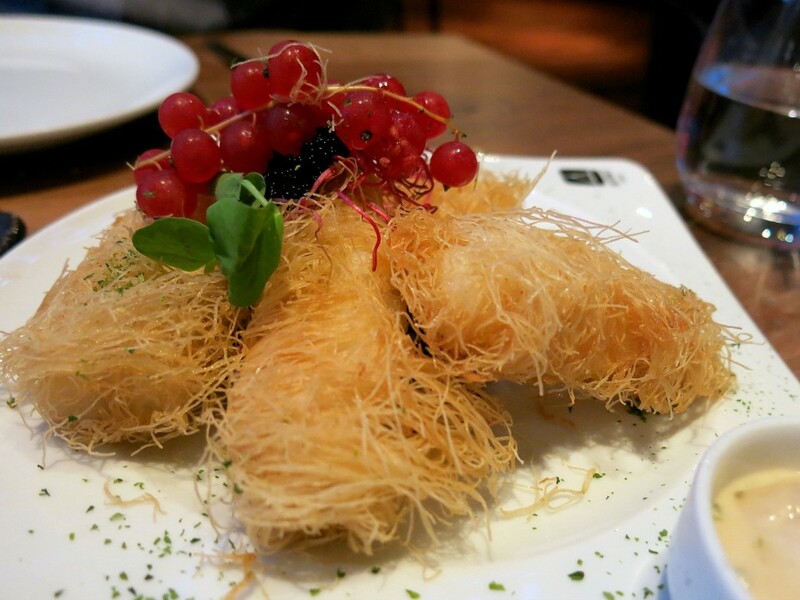 Continuing with fish, we tried the cod kataifi next. This dish split the table! I loved it, D didn’t. I think it was because it didn’t quite fit with the rest of the dishes that had been brought out. What I couldn’t get over was how filling these were! The cod was extremely meaty in texture. I loved the different textures of the crispy greek pastry, flaky fish and the soft pickled seaweed. Also, it’s quite a stunning looking dish too. The final savoury dish was the ricotta and spinach ravioli with broccoli. We loved this dish! The creamy, buttery sauce was a delight and the pasta cooked al dente. Although quite full at this point we polished off the plate of pasta. 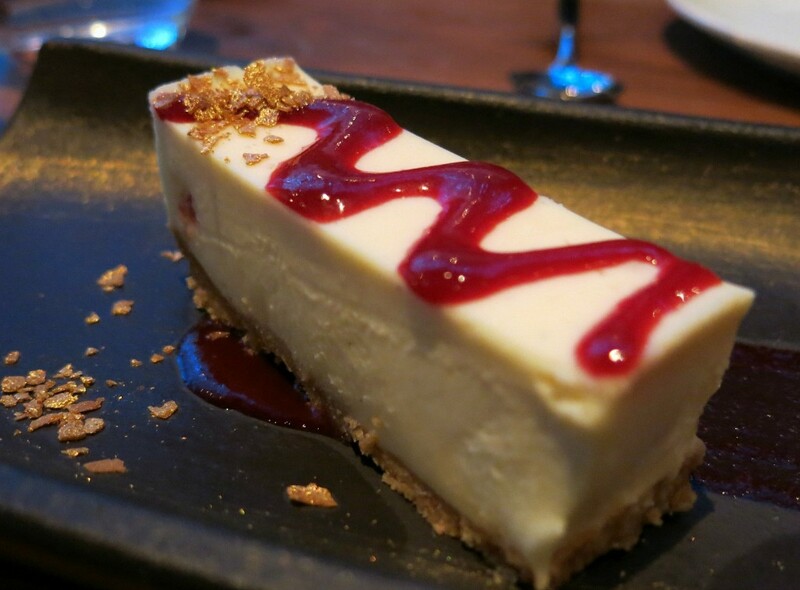 The evening finished on another high with the raspberry and white chocolate cheesecake. You could really taste the white chocolate running through this rich and creamy dessert with the raspberry coulis adding just enough sharpness. I fought D for the last piece! I wouldn’t say we tried the ‘best’ of the menu. The grill section of the menu looks particularly good. We had a lovely meal though with the ravioli and cheesecake being the highlights for me. The staff are also super helpful and friendly which is always a good thing. 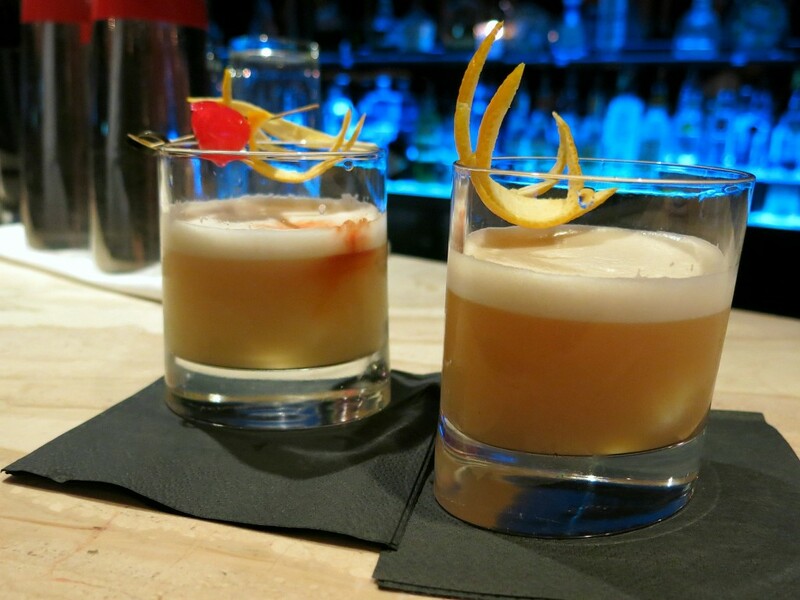 No, it is not the best Japanese/European fusion menu out there, but their cocktails are very good with good food which definitely has room to improve and there’s a great vibe in there. It would be great to come here for a late dinner before heading up into the club or continuing your night else where. *I was a guest of DSTRKT but as always views remain my own including my love for white chocolate cheesecake! I’ve only ever been to DSTRKT for the night-club part, never really thought of going to the restaurant – does look like my type of food, hopefully the standard catches up a little!